^^Certification : ANSI/NSF standard 42 Certified^^Filtration Method : Carbon / Charcoal.^^Filter Life : 6-months^^Filter Capacity : 300 Gallons.^^High Water Flow Rate. 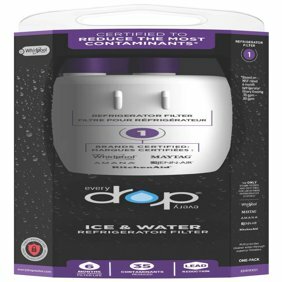 Top-notch replacement filter units, an ideal fit for Samsung Refrigerators. NSF Certified Carbon Blocks meet all material requirements for Standard 42. The filter uses an Activated Carbon Block Filtration layer, which helps remove reduce one of the major injurious contaminants like chlorine. The layer also helps get rid of odor in water. With a life-cycle of 6 months, the Water Filter provides much purified healthier tasting fresh water up to 300 gallons. The The Aqua Fresh WF294 Replacement Water Filter For Samsung DA29-00020B / Kenmore 9101 is designed to decontaminate impure water and make it drinkable. The impure water contains dirt, mud and harmful chemicals such as chlorine, which is very injurious to health. The water filter not only improves the taste by purifying the water and getting rid of the chemical content from water but also removes bad smell. The essential nutrients in the water are preserved so that your body gets all the essential vital minerals. Firstly turn off the water source to the Refrigerator. Locate the pre-installed exhausted filter and remove it by turning the filter in the counterclockwise direction. Hold the new filter in your hands, carefully remove the packaging and sanitary end-cap from the filter. Now, insert the new filter into the filter repository and rotate the filter in the clockwise direction until the arrow at the bottom of the filter is correctly aligned with the arrow on the refrigerator filter head. Ensure that the filter is correctly installed into the refrigerator head using a full ¼ turn. If not so, then it would prevent the valve from opening fully and may cause slower water flow. Dispense some water into a glass ensuring good water flow, if it is slow, remove reinstall the filter till it has been inserted to a full 1/4 turn. Finally, check the filter for leaks in any. The filter needs to be installed correctly so that the water gets filtered out well. To be on the safe side, it is always recommended to replace the filter after a period of 180 days for avoiding health- related concerns. This filter has everything ..